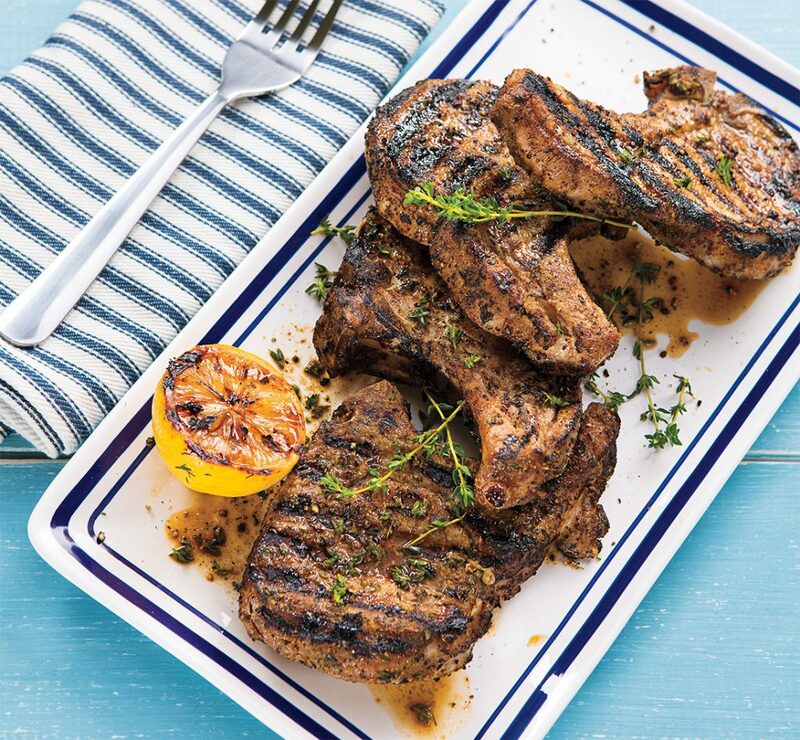 Lemon Grilled Pork Chops are a summery take on backyard favorite. Add some summer to your table any time of year with this Crooked Lemon Grilled Pork Chops recipe. How bout adding a bit of citrus to your BBQ? These lemon grilled pork chops are the perfect way to bring a bit of summery flavor into your life, no matter the time of year. When shopping for pork chops, look for pieces of meat that are pink, with a bit of marbling. And keep in mind that you get what you pay for. You might get a bit more flavor from a more expensive piece, but you don’t need to break the bank to grill a delicious meal. Here’s a hot tip: Before grilling, set the pork chops out for about an hour to take away the chill from the fridge. This will help give you a more even cook. 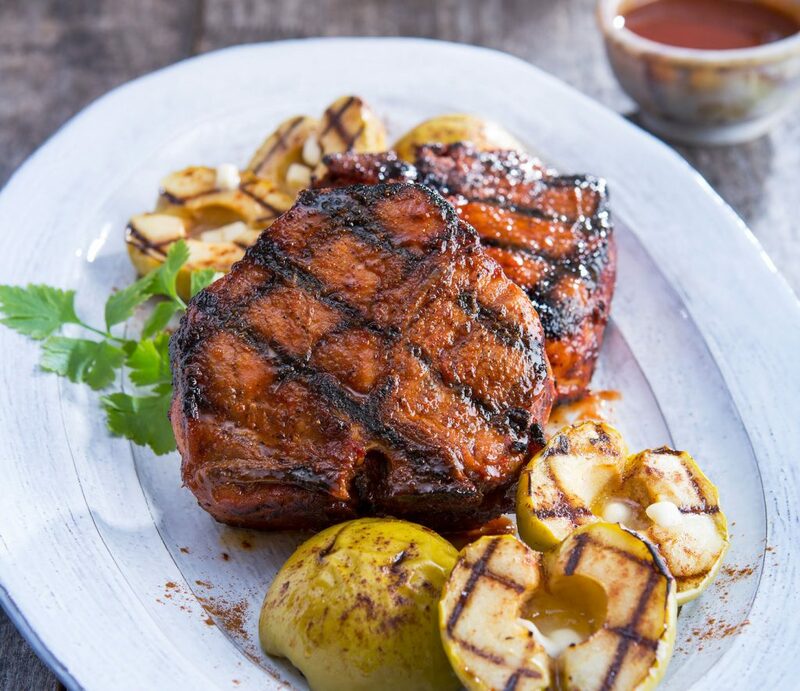 To ensure the best flavor, we recommend letting the pork chops sit for about 15 minutes after seasoning with our Crooked Pig Cane N’ Maple Seasoning. This lets the flavor sink in for a nice kick of Memphis flavor in every bite. Make this recipe feel like new every time you use it by substituting a different citrus. Using oranges rather than lemons can introduce a sweeter flavor profile that complements the pork really well. You should only need to flip your pork chops once while they’re on the grill, probably after about eight minutes. You’ll know your Lemon Grilled Pork Chops are done when they’ve reached an internal temperature of 140 degrees. Make sure you’ve got a meat thermometer handy. As for sides, we recommend some oven-roasted asparagus. Squeeze a bit of lemon over the top to bring the whole dish together. If you’re into the idea of mixing pork with fruity flavors, we’ve got another recipe for you. Our Bacon-Wrapped Pork Medallions with Apple Hickory Butter is a totally different take on pork. This recipe uses our Twist’d Q™ Wicked Sweet Bourbon Seasoning for a little bit of a Southern twist. In a small bowl, combine Cane ‘N Maple Seasoning and thyme. Sprinkle the pork chops with seasoning mixture. Oil a clean kitchen towel and use tongs to coat the hot grill grate with oil. Use tongs to place the pork chops and lemons, cut side down, on the hot grill grate. Cook the pork chops, uncovered, for 12 minutes or until an instant-read thermometer inserted into the pork chops reaches 140°F (internal temperature will rise 5° to 10°F upon standing), turning once halfway through cooking. Cook the lemons 5 minutes or until grill marks appear. Transfer the pork chops and lemons to a serving platter; loosely cover with aluminum foil and let stand 10 minutes to allow juices to redistribute. Serve pork chops with lemons for squeezing over pork. Garnish with thyme sprigs, if desired. If time allows, let the pork chops stand 15 minutes after sprinkling with Cane ‘N Maple Seasoning. Oranges would be a great substitute for the lemons in this dish. To broil pork chops and lemons, place the seasoned pork chops and lemons, cut side down, on a broiler pan. Broil the pork chops 8 minutes or until an instant-read thermometer inserted into the pork chops reaches 140°F, turning once halfway through cooking. Broil the lemons 5 minutes or until slightly charred.